In 2007, I was desperate to buy a new yoga mat because my practice had outgrown the entry-level, low-cost one I’d been using. I had my eye on Barefoot Yoga’s Eco mat, an environmentally friendly combination of jute fiber and rubber, because it got a thumbs-up review in the New York Times, For Some Things, It’s O.K. to Be Sticky (Yoga Mats). I visited the online store repeatedly, but it was out of stock for months. Obviously, the NY Times article generated a lot of demand. I eventually ended up getting a Manduka eKo mat, as I reported in On Mats and Towels. I’ve stayed loyal to Manduka since then. I bought another eKo mat at the end of my yoga teacher training in the summer of 2013 because the eKo mat was falling apart. The rubber surface was coming unstuck from the foundation layer, and the rubber was oxidizing so I no longer had traction, especially when the mat was moist. I hurt myself in a jump-back because my toes did not grip the mat. But if mats are eco-friendly and biodegradable, they age and wear out. That’s what biodegradable means, breaking down into non-toxic components over time. Sun light accelerates the process for rubber-based mats, as with my Manduka eKo mat. I also have a Jade Harmony mat, a gift from my daughter, that has lost texture and feels like an old, crumbling eraser. So there’s a downside. Why do I mention all this? 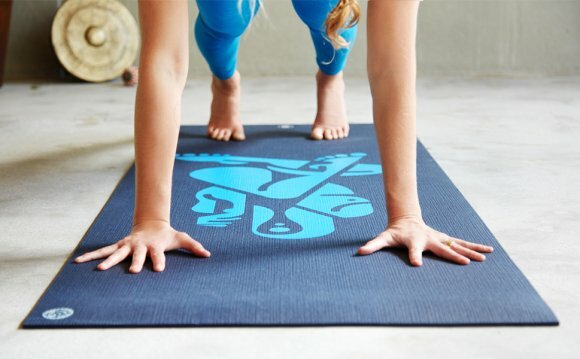 In early August I got an e-mail from Carolina Mills at Barefoot Yoga Company, Seattle, Washington, asking me to a do a review of one of their mats, either a Hybrid Eco-Lite Mat ($23.95 on sale, $26.95 regular) or a Performance Grip Mat ($59). I chose to test the second one, but I told her that I would not get to it until after I came back from my European trip, say October. Carolina sent me a demo right away. The mat stats measures 24″ x 72″ x 4mm, and weighs 5 pounds. It is made of Polymer Environmental Resin (PER). “It does not contain phthalates or heavy metals, and its method of production is completely non-toxic and latex free, ” says Barefoot Yoga’s write-up. It comes in three colors, black, charcoal and espresso, a rather somber selection but that may have to do with the manufacturing process. Lifetime warranty covers one-time replacement of your Grip Mat due to any defects that arise as a result of normal use of the product. Considering the mid-range price and eco-friendliness of the mat, these terms are extraordinary. First, the mat is exceptionally light and compact, easy to roll up and slide in a bag (none of the struggle as with a traditional sticky mat). I have no problem carrying it around. As mentioned, the mat comes in one size. In my case, I prefer a wider mat, say 26-27″, but I’ve discovered that I am not as picky as I used to be. However, if Barefoot Yoga wants to cater to male buyers (taller and broader), they might want to offer a selection of wider and longer mats. Since getting back to my yoga practice, I’ve taken a low-key approach: yin, restorative and nidra yoga mostly, as I try to tame a Type A+ intensity that has predominated in my practice. The Grip Mat was designed for a more active practice so I have not put the mat through a stress test. Its grip should get better as it wears down. I wiped down the mat with a sea salt and water mixture, as suggested on the Barefoot Yoga FAQ page, to speed up the break-in process. A few days ago, my daughter, Stephanie, told me that while I was traveling, she used my Barefoot Yoga mat for her practice. From the start, she found it had a great surface that kept her from slipping, even though it’s not “sticky”. If you want cushion for hands, knees and feet, you may want to use a yoga towel or cut-up mat squares for padding. This mat is not a big, flat sponge. Personally, I appreciate that I don’t feel as if I am sinking into the mat. I am balance-impaired and have peripheral neuropathy. Too much padding introduces a kind of sensory noise. With the Performance Grip mat, I sense a firmer foundation under my feet, and I can move through my sequences with confidence. In fact, the more I use it, the more it grows on me (or under me).